You may want to reset your network router if you can't remember the administrator's password, you've forgotten the network's wireless security key, or you're troubleshooting connectivity issues. 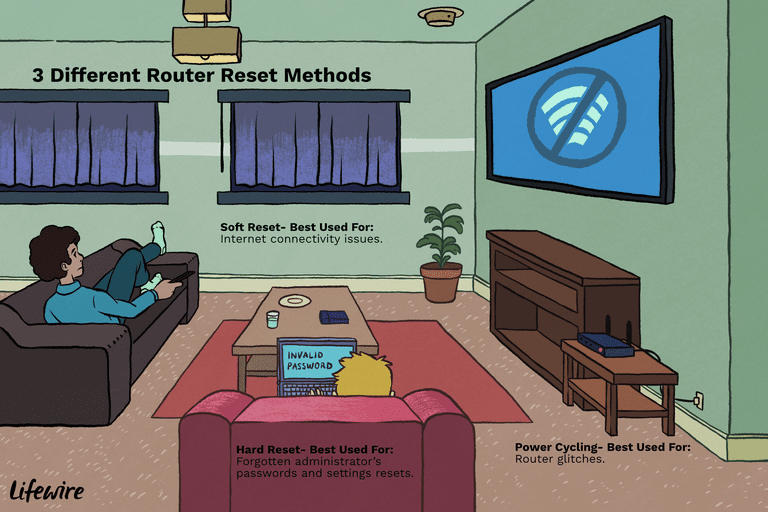 Several different router reset methods can be used depending on the situation. A hard reset is the most drastic type of router reset that's most commonly used when an administrator has forgotten their password or keys and wishes to start over with fresh settings. Since the software on the router is reset to factory defaults, a hard reset removes all customizations, including passwords, usernames, security keys, port forwarding settings, and custom DNS servers. Hard resets do not remove or revert the currently-installed version of router firmware, however. To avoid internet connectivity complications, disconnect the broadband modem from the router before performing hard resets. With the router powered on, turn it to the side that has the Reset button. It might be on the back or the bottom. With something small and pointy, like a paperclip, hold down the Reset button for 30 seconds. After releasing it, wait another 30 seconds for the router to fully reset and power back on. An alternative method called the 30-30-30 hard reset rule involves holding down the reset button for 90 seconds instead of 30 and can be tried if the basic 30 second version doesn't work. Some router manufacturers might have a preferred way to reset their router, and some methods to resetting a router may differ between models. Shutting off and re-applying power to a router is called power cycling. It's used to recover from glitches that cause a router to drop connections, such as corruption of the unit's internal memory, or overheating. Power cycles do not erase saved passwords, security keys, or other settings saved via the router's console. Power to a router can be shut off either by the unit's on/off switch (if it has one) or by unplugging the power cord. Battery-powered routers must have their batteries removed. Some people like to wait 30 seconds out of habit, but it's not necessary to wait more than a few seconds between unplugging and reattaching a router's power cord. As with hard resets, the router takes time after power is restored to resume operation. When troubleshooting internet connectivity issues, it can help to reset the connection between the router and modem. Depending on how you want to do it, this may just involve removing the physical connection between the two, not manipulating the software or disabling power. Compared to other kinds of resets, soft resets take effect almost instantaneously because they don't require the router to reboot. Physically unplug the cable connecting the router to the modem and then reconnect it after a few seconds. Some routers include a Disconnect/Connect button on their console; this resets the connection between the modem and the service provider. Some router brands including Linksys provide a menu option in their console called Restore Factory Defaults or something similar. This feature replaces the router's customized settings (passwords, keys, etc.) with the original ones it had at the factory, without requiring a hard reset. Some routers also feature a Reset Security button on their Wi-Fi console screens. Pressing this button replaces the subset of the router's wireless network settings with the defaults while leaving other settings unchanged. Specifically, the router name (SSID), wireless encryption, and Wi-Fi channel number settings are all reverted. To avoid confusion around which settings get changed on a security reset, Linksys owners can avoid this option and use Restore Factory Defaults instead. If you're trying to solve a problem with your router by resetting it, and that didn't fix the issue, check out our Best Wireless Routers to Buy guide for some replacement advice.